NEW YORK -- A McDonald's employee was stabbed to death early Monday morning in the Bronx after asking an apparent homeless man to leave the bathroom, reports CBS New York. Manager Adam Garcia, 28, got into a dispute with a man who had overstayed his welcome in the bathroom at the New York City restaurant, police said. Garcia escorted the man out of the restaurant and the two got into an argument in the parking lot, police said. The other man pulled out a knife and stabbed Garcia in the neck and chest, police said. CBS New York reports that Garcia then went back into the restaurant where he collapsed. He was rushed to the hospital but didn't survive, police said. "Outgoing, chatty. He spoke about his kid a lot," employee Diomedes Marcelino told CBS New York. Marcelino said homeless people use the McDonald's restrooms daily, or just to sit in. "If a homeless person showed up, we just mostly tell them they can't be here. And if they start getting aggressive, we would just tell them to leave before we call the cops," he said. 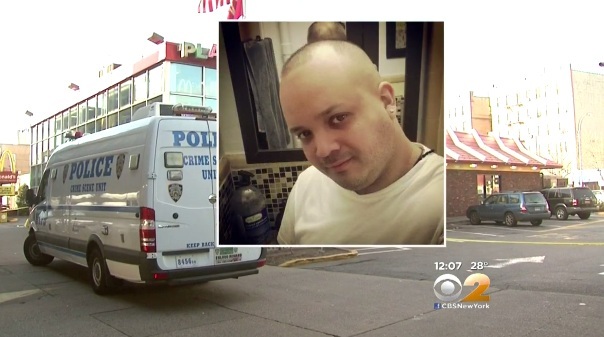 Garcia's cousin, Karen, told CBS New York he loved his family and took his job seriously. "Always worked hard, tried his very best in everything," she said. "He was just coming out of work, an honest, earning man, a family man, just a great person... there's no words for this." Garcia leaves behind a young son who is about 2 years old, CBS New York reports. Police continue to search for the suspect. So far, no arrests have been made.